The Moog DFAM & Moog Mother 32 With Moog 2-Tier Case Bundle provides you with the ultimate analog live performance and production bundle. 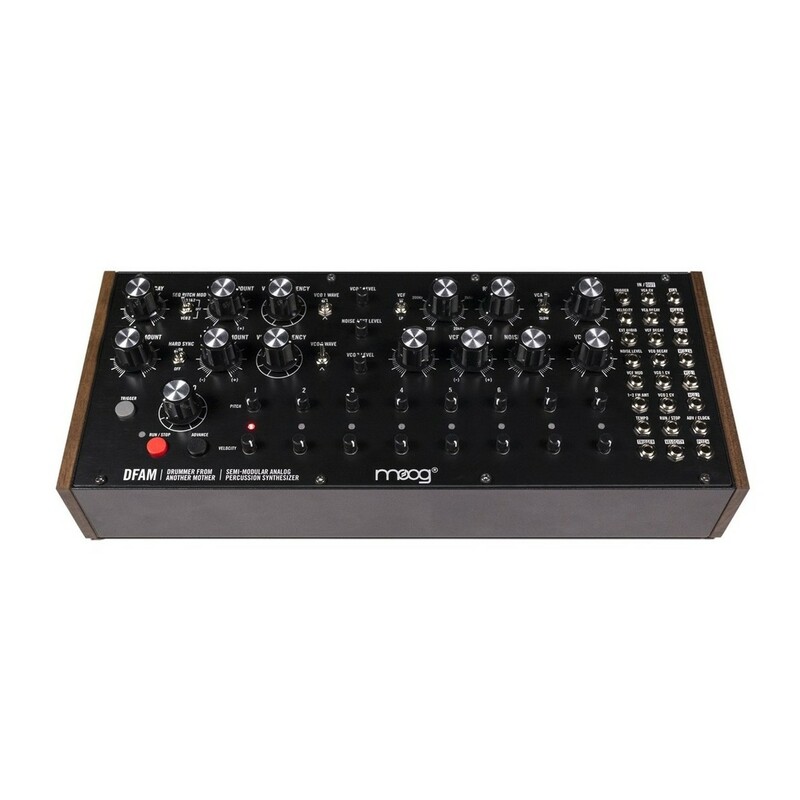 The bundle includes the versatile and powerful Moog DFAM percussion machine, capable of producing huge bass, lead and raw FM percussion sounds. The Moog Mother-32 provides you with a unique range of raw analog sounds and creative functions that are sure to inspire new music. Both devices combined together create a powerful performance and production combination, providing you with unique sounds and endless sonic exploration. Both the DFAM and Mother 32 come with a specially designed case that allows you to keep them together for easy accessibility, providing an all-in-one production and performance kit. The DFAM is a fully analog machine that produces a rich, full bodied, analog vintage sound. The 2 wide-range analog oscillators enable you to create everything from warm, deep pulsing basses to chunky raw FM percussion. It offers a hands-on approach to percussive sequence creation, allowing you to tweak and experiment as you like. Exploring and experimenting is highly suggested. 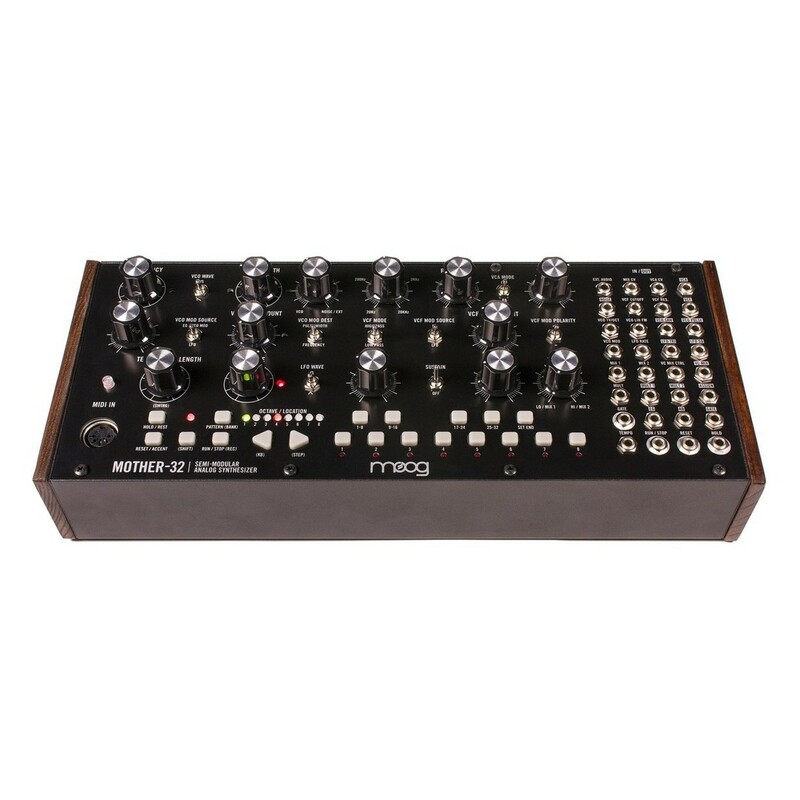 The Moog Drummer From Another Mother (DFAM) features a versatile and easy-to-use 8-step analog sequencer with velocity. It allows you to control the pitch for each step, as well as velocity. This gives your sequence a more human feel rather than robotic. Set the pitch for each step, then adjust velocity on-the-fly to add some movement and variation. The 3 dedicated analog envelopes work dynamically with the sequencer to ensure the toms breathe, impacts evolve, and movement is created with a simple turn of the knob. Each DFAM comes with a number of Moog patch cables that can be used with the integrated 24-point modular patchbay. The DFAM requires no patching to create rhythmic composition, making it ideal for someone looking for their first synthesizer/sequencer. However, for the more advanced user or the experimentalist, the DFAM provides a patchbay that can be used to unlock a whole new array of sounds and behaviours. The patchbay is also a great way for beginners to delve into the world of modular patching. 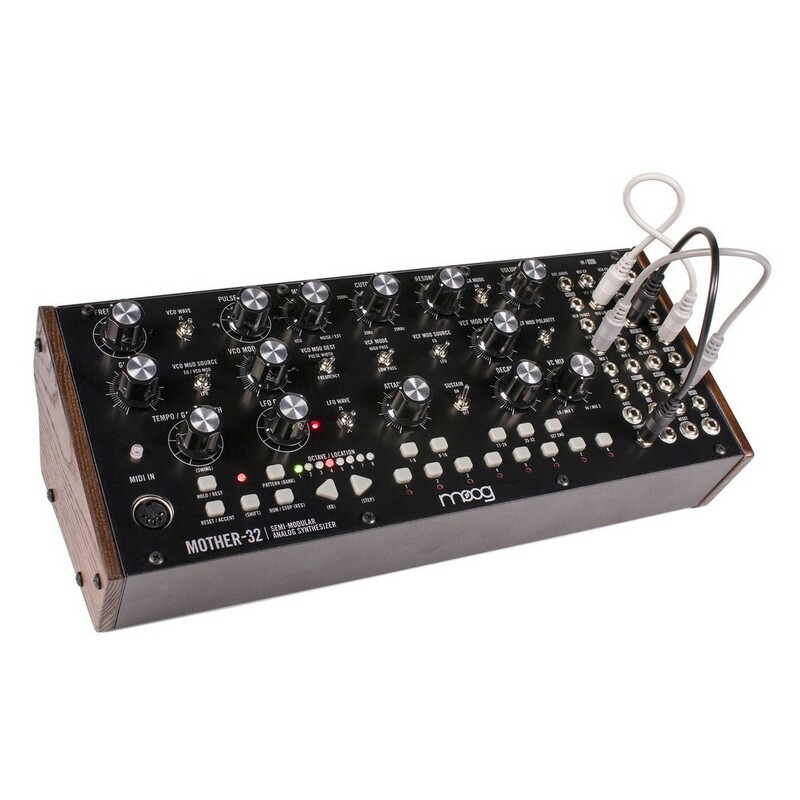 Additionally, the Moog DFAM can be easily removed from its case and mounted into a eurorack system (requires a 10 to 16 PIN eurorack cable). The DFAM offers a range of controls for creating and tweaking sounds. 2 oscillators offer hard sync and FM cross-modulation, allowing you to shape between rhythmic pulsing sounds, classic FM bass, and resonant bells instantly. 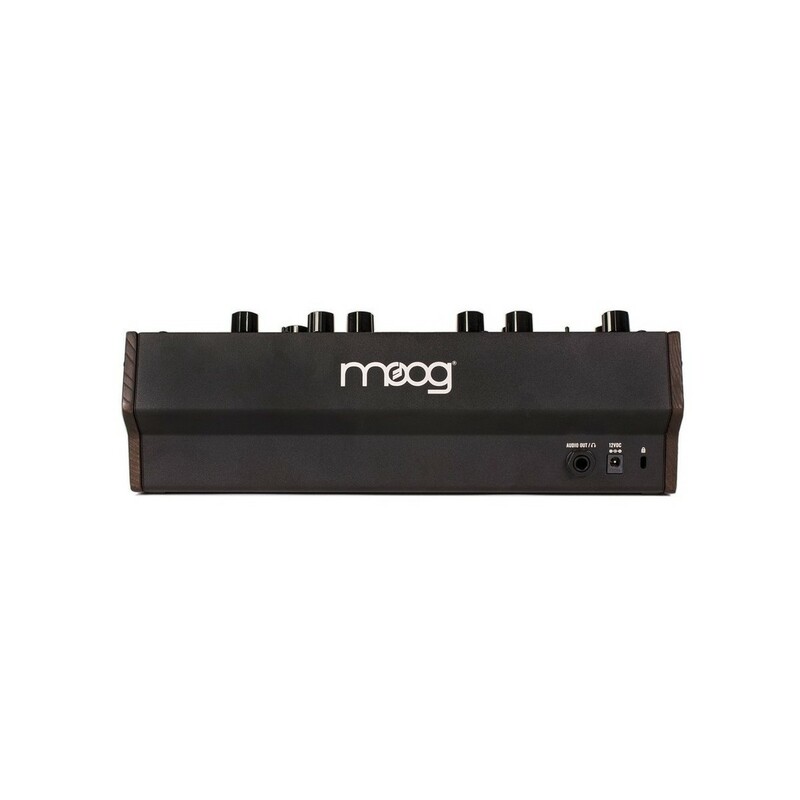 The integrated Moog Ladder filter offers high and low-pass, allowing you to dynamically shape your sound. The DFAM also features a white noise generator, allowing you to add air and high frequency content to your sounds. The DFAM is capable of creating everything from huge bass tones, leads, and most importantly, raw FM percussion. 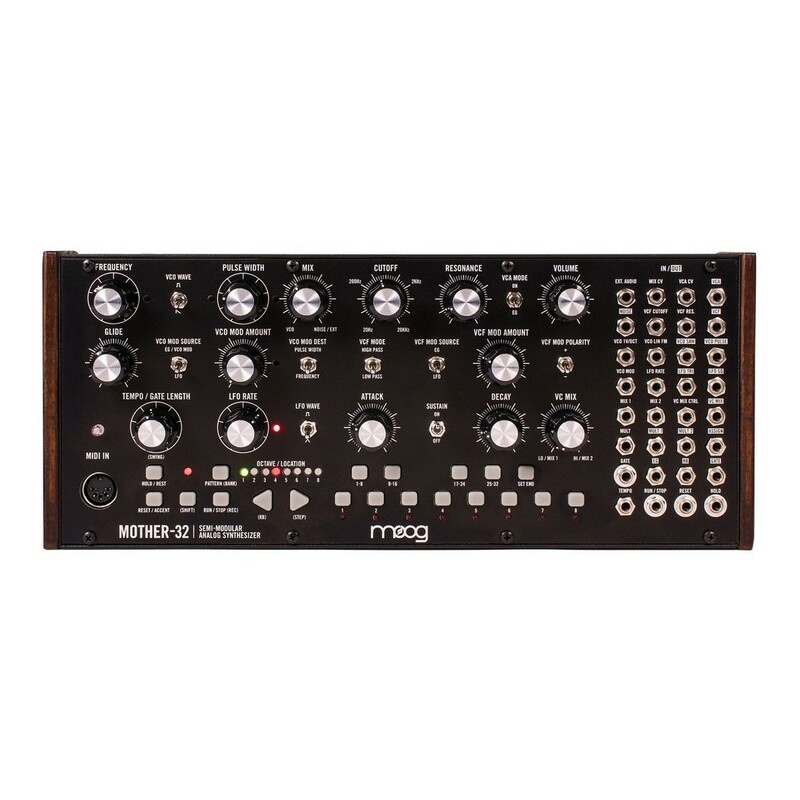 Mother-32's semi-modular design means that no patching is required to create powerful analog sounds, allowing musicians of any experience to quickly begin making music. Synthesists will enjoy exploring the extensive 32-point patchbay, unlocking truly expressive, unique and complex synthesis capabilities. The patchbay also delivers access to a wide range of both sounds and functionality, including an assignable CV output jack, MIDI to CV conversion, external audio input, a second voltage-controlled mixer and multiple unit expandability for almost endless creative possibilities. 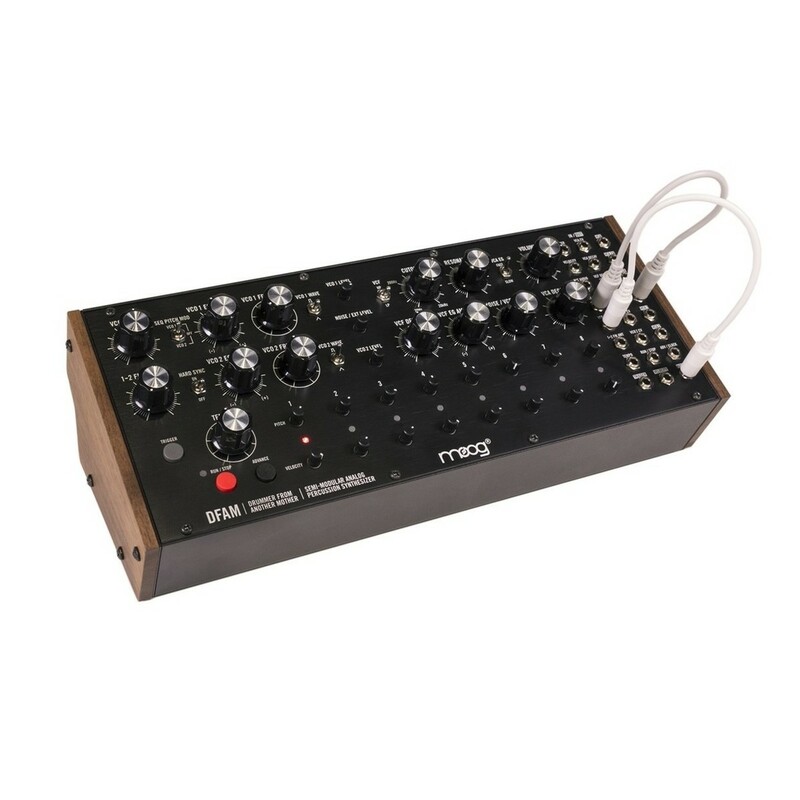 The Moog Mother-32 comes equipped with various onboard sound sources that include a powerful 10-octave analog oscillator with variable pulse width, and an analog white noise generator. The signals from each sound source are then blended together by a voltage-controller mixer for dynamic sound creation and manipulation. From the mixer, sound then travels through a Moog Ladder Filter with selectable low-pass and high-pass filter types. 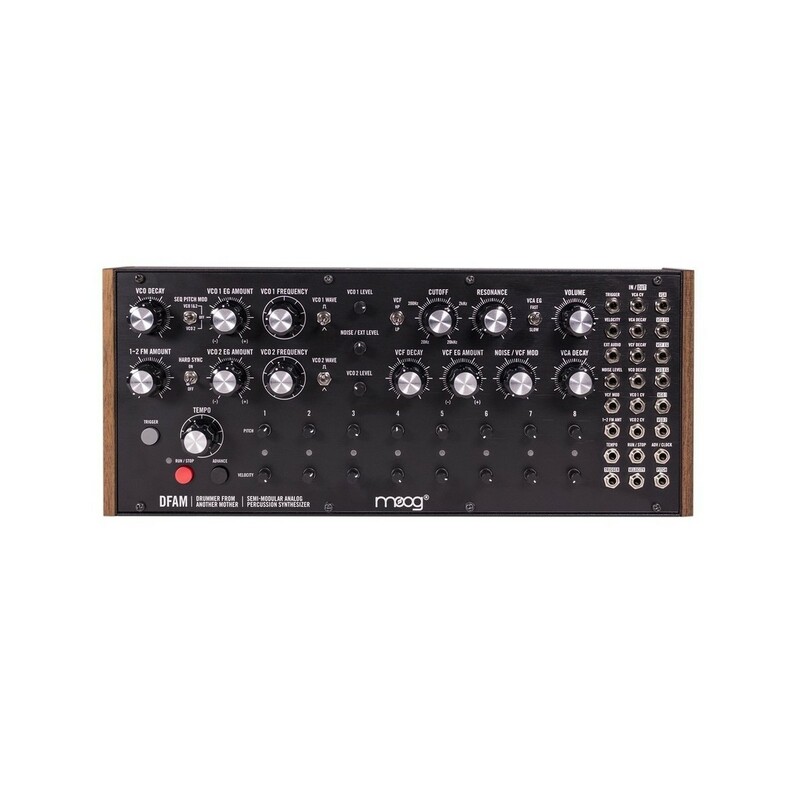 Musical creation and programming is executed via Mother-32's comprehensive 32-step voltage controlled sequencer, or an external MIDI controller. By having the choice of two sequencing styles, you have the ability to quickly create new musical ideas with ease and familiarity. A total of 64 patterns can be stored and recalled from within Mother-32's memory bank, making it ideal for live performance. 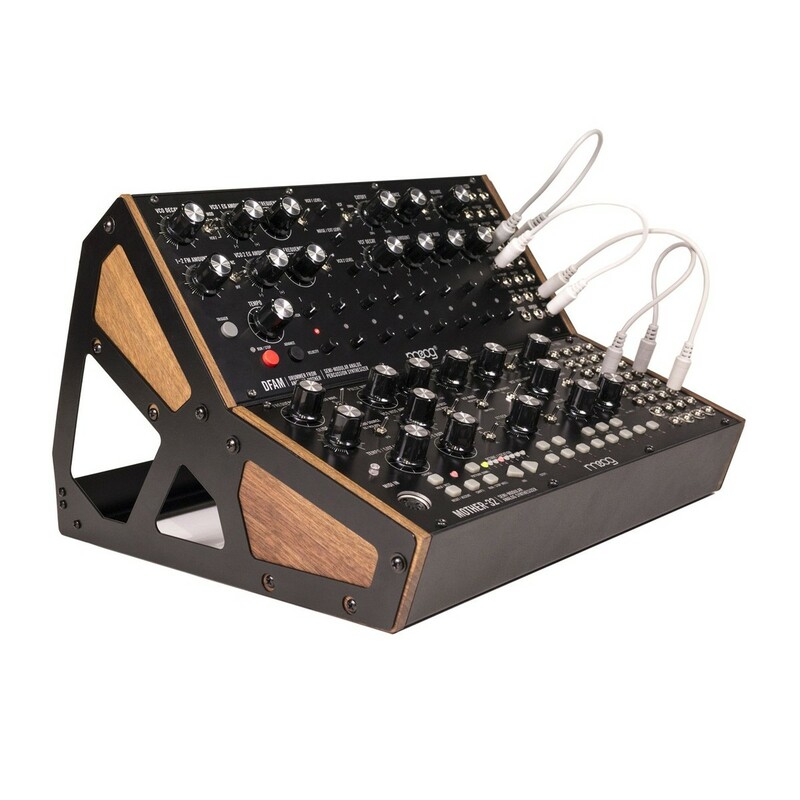 The Moog 2-Tier Rack Kit is designed to combine two the Moog DFAM and Moog Mother 32 synthesizers together. It mounts them vertically giving you the ability to link them together via the patchbay. This rack kit provides greater creative possibilities, as well as increasing both modularity and synthesis capabilities.